I don’t really advertise anything here, but here are a few things worth advertising for and/or are ad-related. Get Cookie Monster to Host Saturday Night Live! Want to see Cookie Monster host Saturday Night Live? I would. It would be interesting to watch. If he’s on, it would give me a reason to watch SNL, for once, as I usually don’t find it to be all that funny. (They have some good skits sometimes, but those usually go viral on the internet, so why bother sitting through the rest of it?) But hey, if Cookie Monster can speak at a commencement, why not SNL? Support him here. Michael Earl’s students from the advanced TV puppetry class will be doing a graduation show on December 13 in West Hollywood. It’s a musical called It’s a Monster World and I am going. Anyone else want to come? This looked really fun, and I have several friends that’s going to be in the show, so I have to say, I wish that I had been a part of this. Now I will just regret preliminarily (or should I just call that pregret?) for not signing up for the class and maybe regret officially after seeing the show. And then retract the regret (ungret?) when (if) the class is offered again. It’s weird. His classes just seem to get awesomer and awesomer. That actually made me not want to sign up for the class right away, because I was expecting it to get even more awesomer. That said, I am signed up for the theater puppetry class next year. 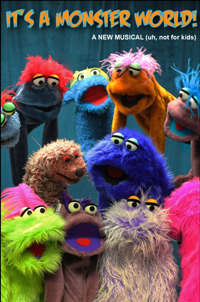 To check out all these puppeteering and puppet-making classes, go to the Puppet School website. I think it’s really cool about you being in the Farmer’s commercial. I would have liked to have to heard this, even though I would not understand it. When it comes out, will you be able to provide a link so we can’t listen to it? It’s be nice to hear your voice! I think you’ve had a very interesting and creative year:~) You designed that app and now you have the radio commercial, as well produced your own puppet videos (I love these). My favorite was the puppet opening the iPad. I smile even now when I think about that video. Be proud of yourself…you’ve done some remarkable things this year! This year… well, income-wise it wasn’t that great. But I hope that the ground work I laid down will make next year a good year! Like Sara before, I’m not in Facebook, so couldn’t vote for Cookie Monster, but I support his ambition of becoming the next SNL Host. Like you, will also give me a reason to watch the program. Keep going man! you are very creative and the money part will come sooner or later! We’ll see. It doesn’t air until February so I can’t really get my hands on it yet. I am going to ask them later, if I remember. I love Cookie Monster… Though, his image is sullied about since I did date a guy nick named the cookie monster… HOWEVER… The furry blue awesomness still shines through. Oh yeah. That reminds me. How do you like Elmo. He’s ginger, you know. Ah, entourage of puppets. That’s what’s missing.